On January 9, 2013, after several months of negotiation, the Ontario Public Service Employees’ Union (OPSEU) reached tentative agreements for Central, Unified and the Corrections division with the Ontario Government. Negotiations began in October, and mobilization efforts were underway across the province. From the start, OPSEU President Warren ‘Smokey’ Thomas publicly offered concessions: a two year wage freeze in exchange for ‘freezing’ the other benefits and rights in the collective agreement. How could the President of our union make such an offer without obtaining membership approval first, and what kind of example is it when our leadership is willing to give up hard won benefits prior to bargaining? Also lacking was any attempt to work in a common front with the house of labour against Dalton McGuinty’s austerity agenda. Indeed, in true sectarian fashion, OPSEU organized a separate protest to occur at the Ontario Liberal leadership convention early in the morning, denying members from outside Toronto Region 5 the opportunity to participate in the Ontario Federation of Labour afternoon protest demonstration and rally (because they would need later bus transportation back to their regions across the province). The OFL rally was planned months in advance. It will speak for the majority of the labour movement. OPSEU previously launched the ‘Invest in Ontario’, or anti-wage freeze campaign. 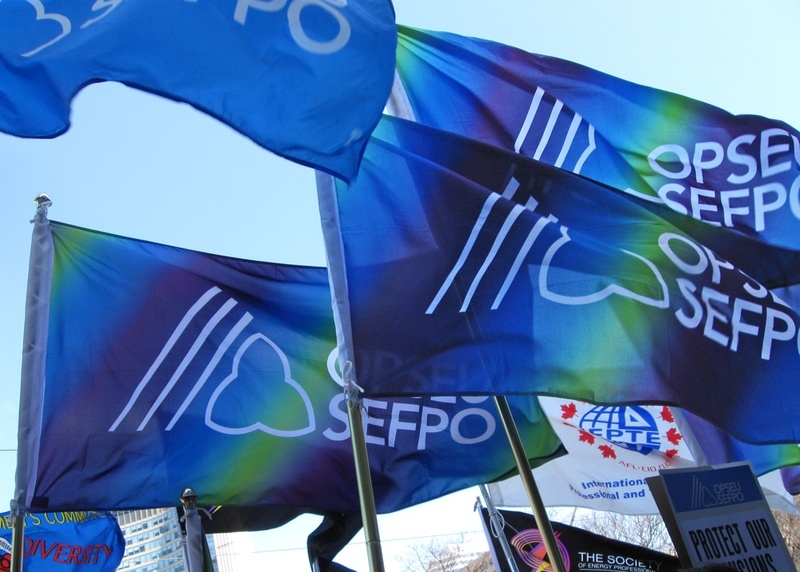 OPSEU’s message was an adamant ‘NO’ to freezing wages. So what changed? Why would our leadership give up something as important as wage improvement when the cost of living continues to rise? The cost of gas, rent, groceries, and taxes goes up. Retirees have to work longer to save money. Youths leave school with massive debt. And don’t forget that the membership actually prioritized wages at demand setting. The two year wage freeze represents a loss of over 4% of wages when inflation is taken into consideration. While members will continue to progress up the wage grid, the 3% lower first new step in the grid will have a major impact on new hires. The deal also removes termination pay for new employees who are surplussed. This is a dangerous move towards inequality among our members in the OPS. The steps towards a two-tier wage structure is a betrayal of young members. It sows the seeds of a union divided. Who can our union count on to staff picket lines during future attacks on our rights? OPSEU seems on the way to joining the ranks of those major Canadian unions that surrendered serious concessions. Union leaders of auto workers, steel workers, postal workers, and Catholic teachers gave way. Then elementary and secondary public school teacher leaders caved to the OLRB ruling banning a one-day political strike, and now all teachers are resigned to living under the thumb of undemocratic Bill 115. Labour brass rhetoric aside, concessions bargaining is now the norm, not the exception, impacting most harmfully on youths, women and immigrant workers. While there are some improvements to the OPS contract language concerning redeployment of surplussed members, the agreement is largely devoid of any significant gains. It is important that members with seniority have opportunities to be redeployed into new positions as many of these members have limited exposure to varied skills and knowledge, and have worked loyally in their position for years, focusing on a specific fields. Some members don’t have many options to train for a new career path. The loss of surplus factor 80 (age, plus years of experience) is the loss of an important retirement option for many facing layoff. Today the labour leadership has virtually abandoned the fight against the capitalist austerity agenda. The labour-based New Democratic Party has likewise played a pathetic role, shying away from taking a strong stand for workers and against austerity. Ontario NDP Leader Andrea Horwath has failed to defend workers publicly. She focuses her criticisms on the financial costs to be incurred by government in defending the legality of the actions of the big business parties against labour. Needed now, more than ever, is a working class fightback in the NDP, to push the party to the left to challenge austerity, and to embrace more democratic and socialist principles. There are good examples of effective protests against austerity. The Occupy movement, under the slogan ‘We are the 99%’, showed for the first time in a generation that there is a class struggle, that working people did not create the economic crisis, and should not pay for it. The massive and persistent Quebec students’ strike in 2012 is another excellent example of a fightback against austerity. Striking Quebec students rallied public support for universal access to quality post-secondary education, and hastened the defeat of the governing Quebec Liberal party and the reversal of the tuition hike. This shows what is possible when there is progressive leadership. OPSEU would be in a better position now to fight and win if it had launched a mobilization effort months before the beginning of bargaining, through bulletins, guest speakers at local events, and regional educational conferences on what capitalist austerity is, and how to fight it. The union should have focused on a clear message, such as ‘no concessions’, or ‘we didn’t create this crisis, and we won’t pay for it’. Members require the tools to fight back. That is what the union should have provided. Instead of holding a ratification vote on this concessionary agreement, OPSEU should have launched a strike vote prior to the Liberal Convention. Based on reports from mobilizers across the province, we know that we would likely have received a strike mandate. This would have had an impact by putting pressure on the Liberal party, which heads a minority government, suspended the Legislature, and is choosing a new leader. By accepting concessions, OPSEU signals to the ruling class that it will tolerate what the Liberals are doing – in effect making working people pay for the economic crisis we are enduring. Statements such as ‘the government would not budge’ are a very poor excuse to accept concessions. If the bosses don’t budge, why should we collapse? Some argue that OPSEU got a better deal than AMAPCEO, which lost some benefits that OPSEU members never enjoyed. Our union should not look to AMAPCEO, which is a small, semi-managerial bargaining entity whose members lack experience in defending their collective agreement. OPSEU should have provided better leadership to its own members, and a better example to other unionized workers. How? By launching a real fight back against austerity. Typically, union bureaucrats lack confidence in the membership, which is why they did not want to chance a strike vote. The idea that labour will turn things around ‘when the economy recovers’, or that a struggle against management will occur without the union rank and file challenging and overcoming the union bureaucracy, are grand delusions. Class struggle opposition in each union is no abstract ideal; it is an urgent necessity to avoid an accelerating descent into labour hell.